Day 12 of our summer 2012 trip began with rain and a cool 58 degrees inside the camper. We decided to go into town and find a laundromat. The Town of Jasper was scenic and had a rustic looking information centre with extremely helpful volunteers staffing it. We found the laundromat and paid $4.00 per load for two loads of laundry. Total cost: $16.00 for 2 loads washed and dried. 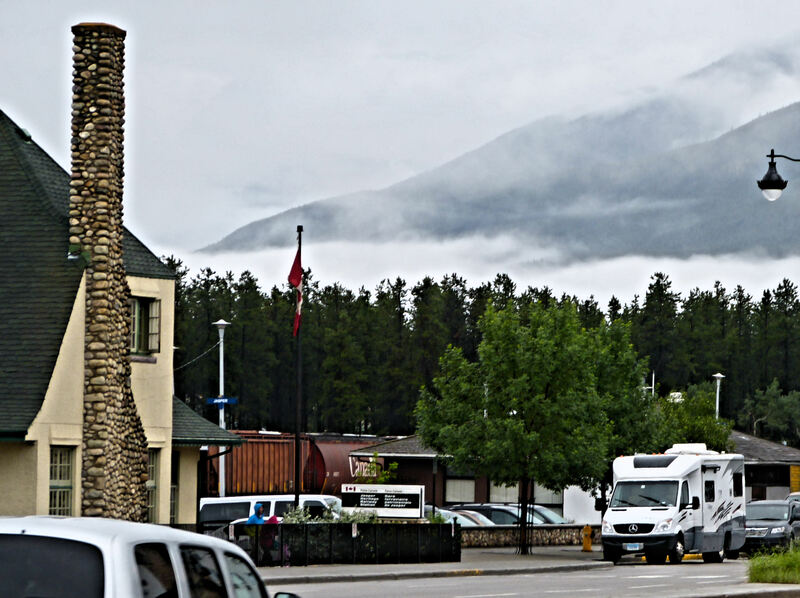 While the laundry was being done WB and Charlie familiarized themselves with the Town of Jasper. WB actually visited me in the laundromat, but when more people arrived, we decided it might be best to abide by the “no dogs” sign. 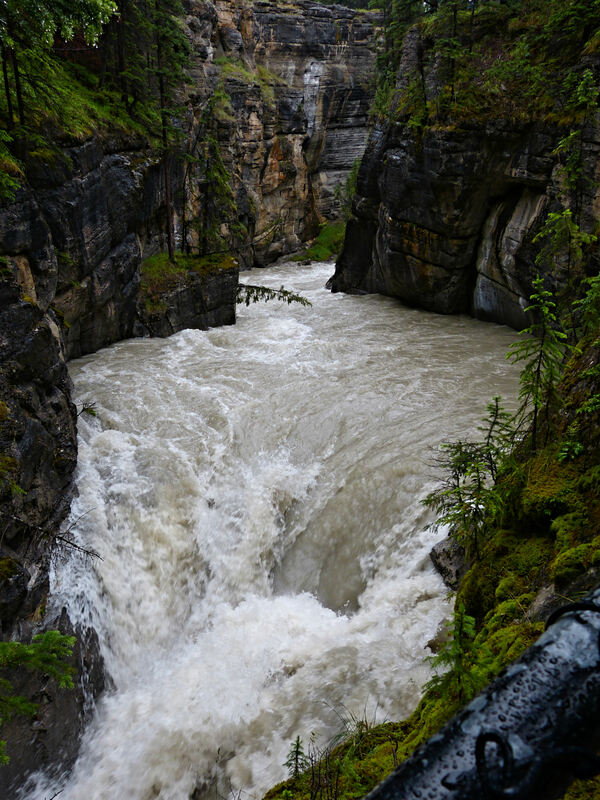 Next we headed to Maligne Canyon and walked the nature trail in the rain. We also drove down the valley past Medicine Lake, but could not drive all the way to Maligne Lake because the road was flooding that day, and there had been several mudslides in the area in recent days. Medicine Lake was glacial blue and the first of many beautiful lakes we visited last summer. 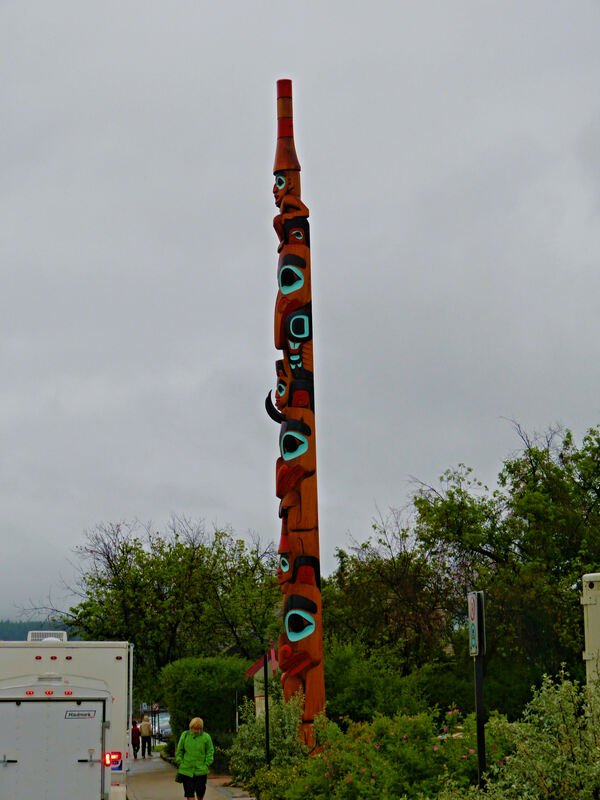 A totem pole in downtown Jasper. The next morning we woke to cloudy skies , but no rain! Woolly Bear and I saw an Elk while walking in the campground first thing in the morning. 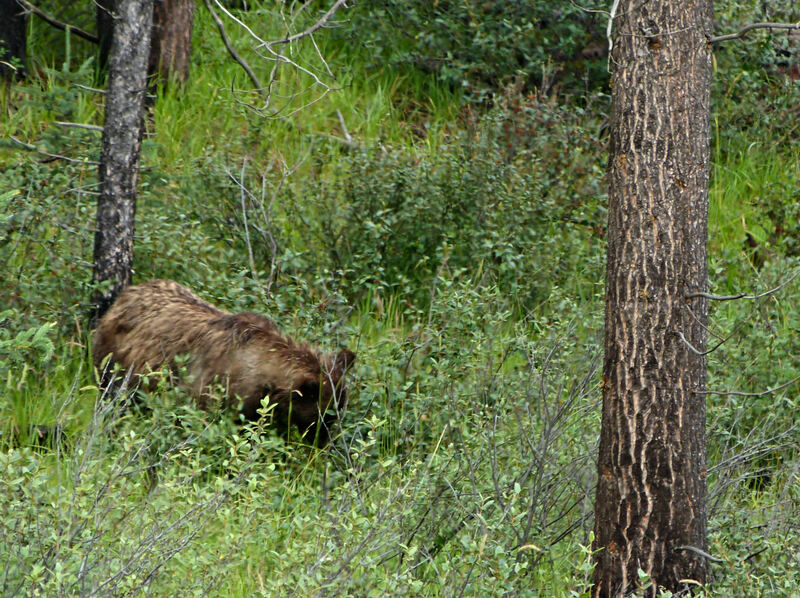 Then, when we were driving out of our campground we spotted a large Grizzly just inside the camp perimeter. High water at Miette Springs. 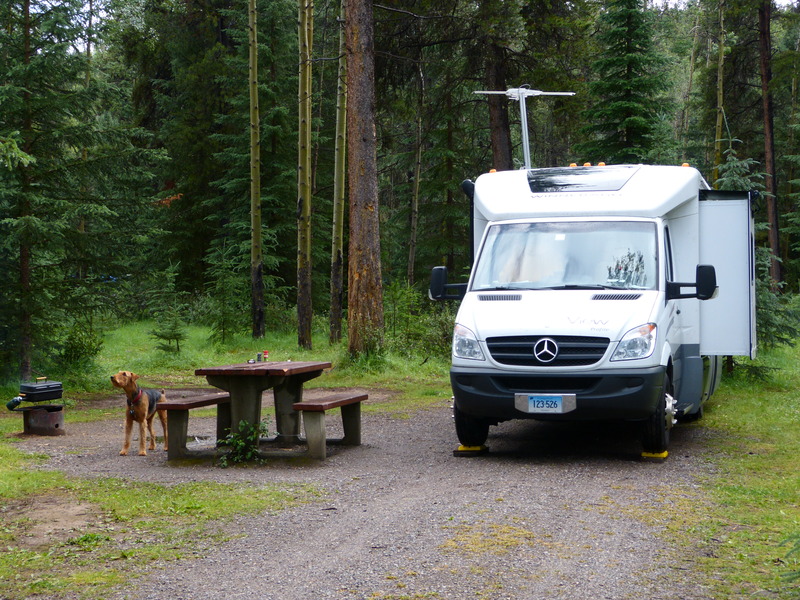 We decide to head north in the park and drove to Miette Springs. We had a nice hike to Sulfer Ridge, about 3 miles of steep hill climbing. Upon returning to the springs, we saw lots of BigHorned Sheep in the parking lot of Miette Springs. They were licking the road salt off the vehicle tires. The View at our Campsite at Whistlers Campground, Jasper NP. When we returned to our campsite at Whistlers we found 7 Elk resting at our camp site. 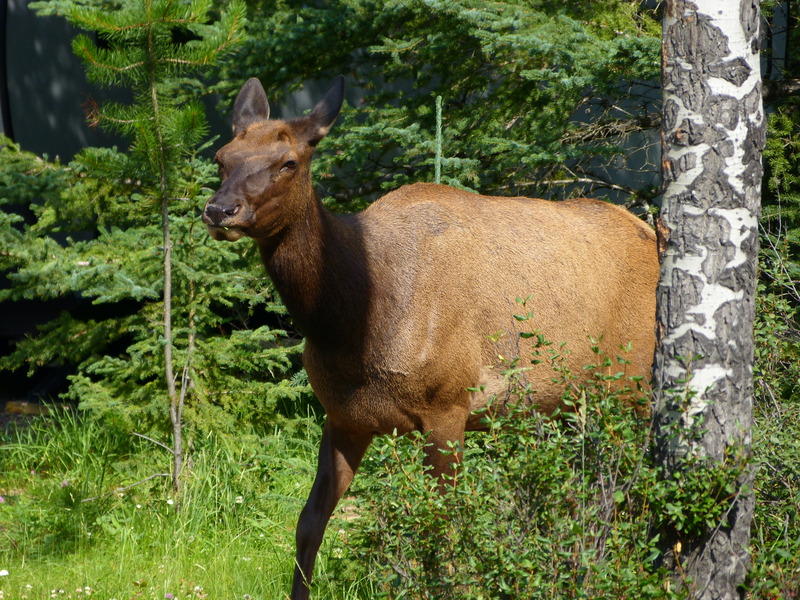 A mother elk in our campsite! Every afternoon the mothers and babies convened near the camper. This behavior protects the babies from the Grizzly Bears. 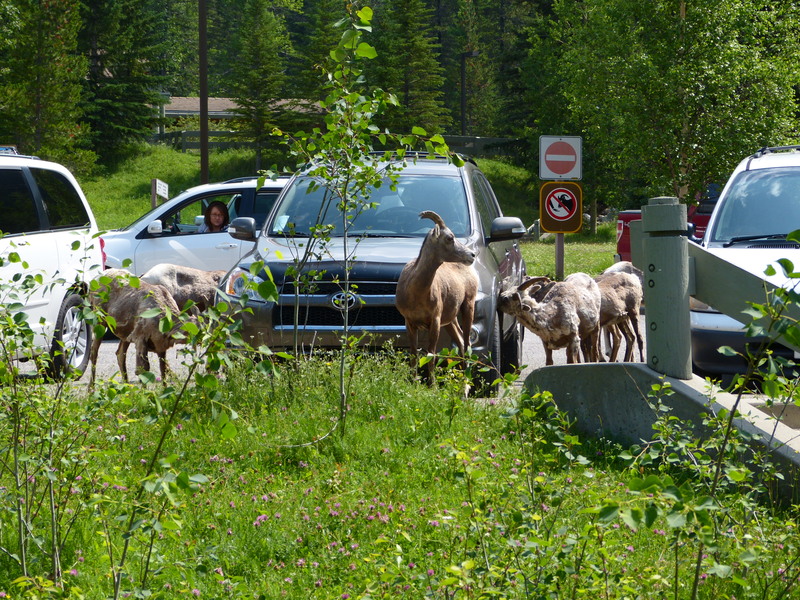 Sheep at Miette Springs parking lot. Grizzly Bear at edge of Whistler Campground, foraging. 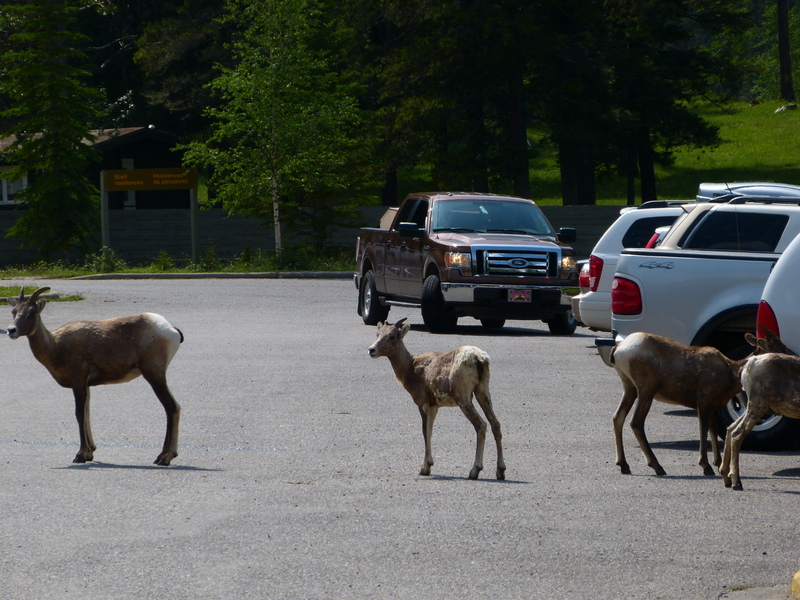 Big Horn Sheep at Miette Springs parking lot. 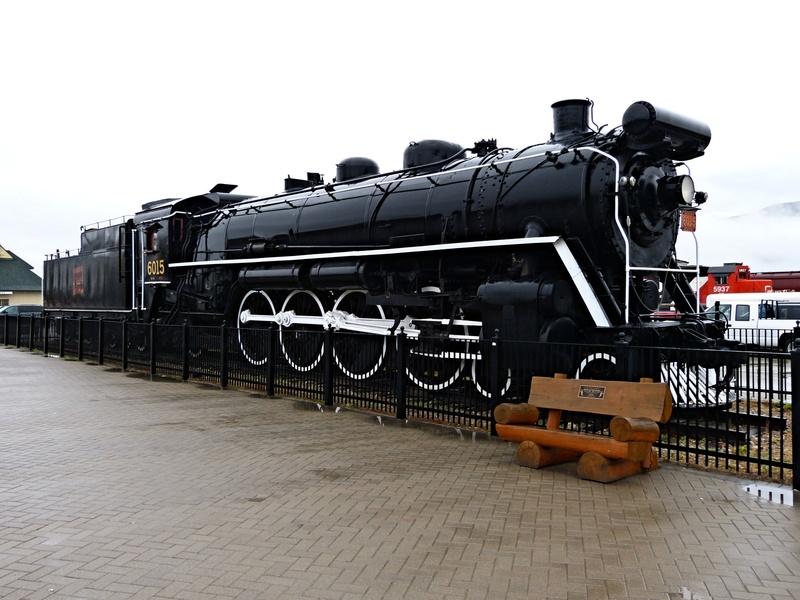 This entry was posted in camping, Canada, National Parks on June 24, 2013 by Ramblin' Rose. Thanks for bringing us along on your journey Sara; I can’t wait to see where your next adventure takes us. It’s truly amazing to me how close you were to buffalo, elk and the grizzly (WB never barks? A dog that well behaved should be allowed to remain in a laundromat! Even one that charges $16 for two loads…) I enjoyed reading about the parks, the wildlife and the road trip challenges like lost keys and pricey beer! Carrie, thanks for taking the time to read and comment on my blog. WB actually has better behavior around large animals than when a crow flies over him. I think it is because he grew up on the farm with the Percheron and Shires, as well as the llamas. I think he thought the Elk were just other farm animals, and sort of took them for granted. Thanks for your encouragement!